It is said that on a good day one can glimpse distant Greenland from Iceland. This may be an exaggeration, but the existence of links of land across the North Atlantic played a key role in Norse exploration, along with the development of new types of ships and new navigational technology and knowledge. The Faeroe Islands, not far from Britain and probably already known to the Romans, were settled first, early in the Viking age. From there the Vikings settled in Iceland, perhaps known to the ancients and certainly to the Irish, starting in the ninth century after evicting a few stray Irish monks. From Iceland the Norse continued west to Greenland in the second half of the ninth century, and then to the islands and coasts of North America by around 1000 c.e. The Greenland of the Norse age of exploration was warmer and had more open land, allowing a limited agriculture. It was also uninhabited. The Eskimos and similar groups had yet truly to settle the area when the Norse came, although they did begin to penetrate south after their arrival and may have been a factor in the final extinguishing of the colony in the 15th century. It was thus not misnamed, but in the ninth and 10th centuries was truly a green land and eminently suited for the Norse way of life with its fjords, turf, and seacarried wood from what is now Canada. Greenland was also known for its fisheries and marine mammals, including the narwhal, a source of valuable ivory that later became the principal export of the Norse colony and was highly prized in medieval Europe. According to Icelandic tradition, mainly from his saga, it was Eiríkur Raudi, or Erik the Red, who was the motive force behind Norse settlement of Greenland, trying to outrun his own legal problems (he carried outlaw status in both Norway and Iceland). Over time two distinct settlements emerged there: Vestribyggd or Western Settlement, and Eystribyggd or Eastern Settlement. 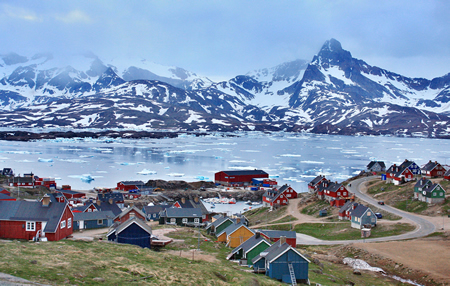 The former was the first settled, in 986, and was located near modern Nuuk. The latter was around what is now Narsarsuaq and began a decade later. Scattered settlements arose in other places where conditions were favorable for fishing or hunting. Both settlements prospered into the 12th century when a downturn in average temperature began, briefly arrested by an improvement during the 14th century. By then it was too late, and the viability of the Norse of Greenland had declined to the point that survival was difficult, if not impossible. The Western Settlement was abandoned in the mid-14th century and the Eastern Settlement died out in the late 15th century. Ultimately isolation and a progressively more difficult environment with the beginning of the Little Ice Age (which put more icebergs into the seas, making travel more difficult) doomed the Eastern Settlement. Both settlements left behind substantial archaeological remnants, including fragments of the material culture of the era, preserved by the cold. This included clothing, in some cases in the latest European fashion. From these fragments it is clear that the Norse of Greenland tried to maintain at least the semblance of their European culture and its values. Also associated with Norse Greenland is evidence of wider contact with the islands and mainland of North America. The most famous example of this is the brief Norse settlement in Canada, Vinland (L’Anse aux Meadows, Newfoundland). In addition archaeology and an examination of written sources have suggested Norse presence not only all and up down the Greenland coast, but on Baffin Island and at points north and south and even farther into the interior. At some of these locations, Norse from Greenland came into contact with Native Americans, including the Eskimos, who were to replace the Norse in Greenland, perhaps by force. It is conspicuous that the only North American culture to make bronze was one in close contact with the Greenland Norse, who knew how to work with bronze.